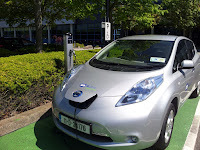 There were two electric charging stations recently installed outside the place I work (the IBM Technology Campus on the outskirts of Dublin). Of course not many people have electric cars yet, so the charging station is not exactly overloaded. In fact until today I never saw a car plugged in. Today the weather was scorching so I decided to go for a walk at lunch time. I was pleasantly surprised to see a car using the charging station for the first time ever. Am I the real Brian O'Donovan or BOD?